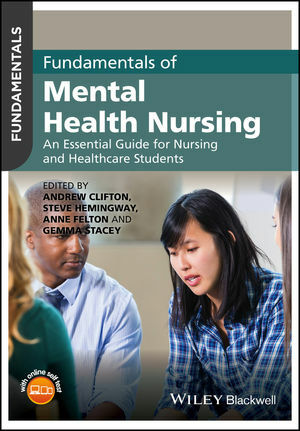 Fundamentals of Mental Health Nursing is an accessible evidence-based introduction to the role of the mental health nurse. This comprehensive overview explores concepts of mental health and distress, ethics and accountability, key nursing models to be aware of, and the prevalence, predisposing factors and features of the most commonly occurring mental health problems. Information is placed in a practice context from the outset, making this an essential guide to both the theory and the practice of mental health nursing. It is ideal for students on courses relating to mental health care, as well as for registered nurses and health care practitioners looking to revise their knowledge of key concepts. Dr Andrew Clifton is Senior Lecturer in the Faculty of Health and Life Sciences at De Montfort University. Dr Steve Hemingway is Senior Lecturer in Mental Health Nursing at the University of Huddersfield. Dr Anne Felton is Associate Professor in Mental Health and Social Care and Dr Gemma Stacey is Associate Professor in Mental Health and Social Care, both at the Faculty of Medicine and Health Sciences at the University of Nottingham.